I don’t often tackle a room remodel by myself- typically my adventures are limited to small projects- but not too long ago I took a deep breath and dove into one of my biggest projects: remodeling a tiny bathroom cursed with peach tile, peach walls, and an 80’s vanity. 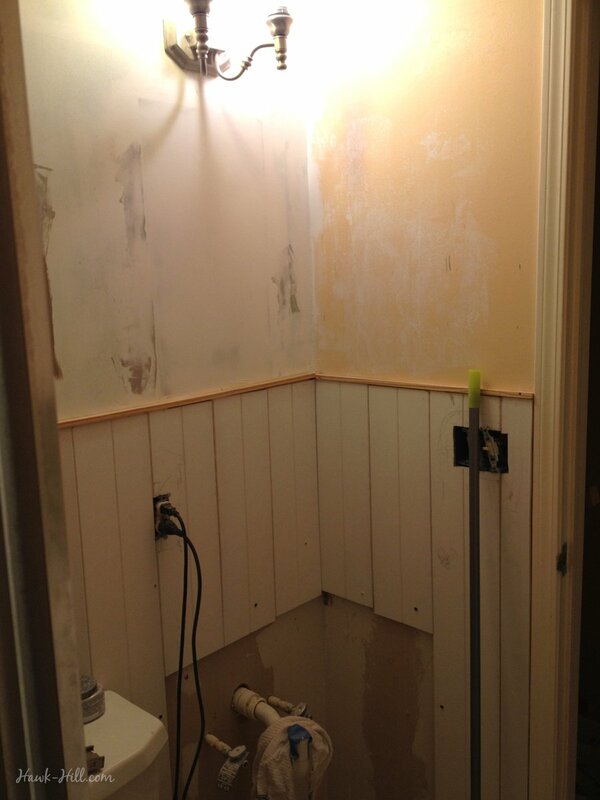 Lacking the tools, funds, skill, and confidence to demo down to studs and remodel “properly” I decided, on a whim and a tiny budget, to see what would happen if I simply installed beadboard over the existing tile. 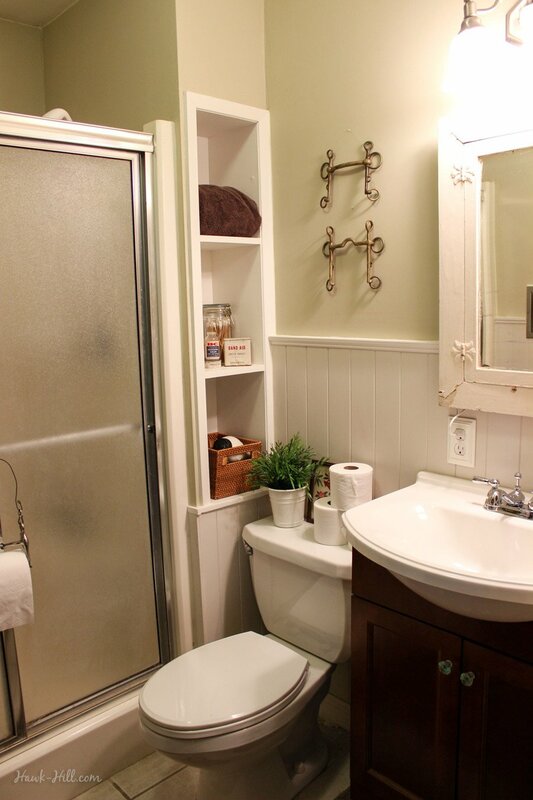 I found wainscotting style MDF paneling on sale that I liked, but I think this same method would work for installing shiplap over existing tile (you’d just need to add a recessed line of waterproof caulk in the gaps of the shiplap boards). 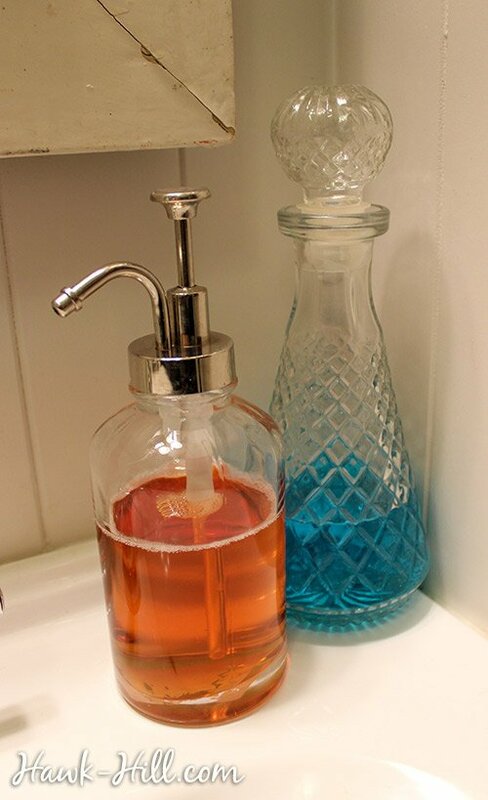 Honey oak cabinets, peach tile and a plate glass mirror with 80’s style vanity was the shameful secret bathroom in my house! peach on peach on taupe… 8 yellow-tone lightbulbs were not helping! 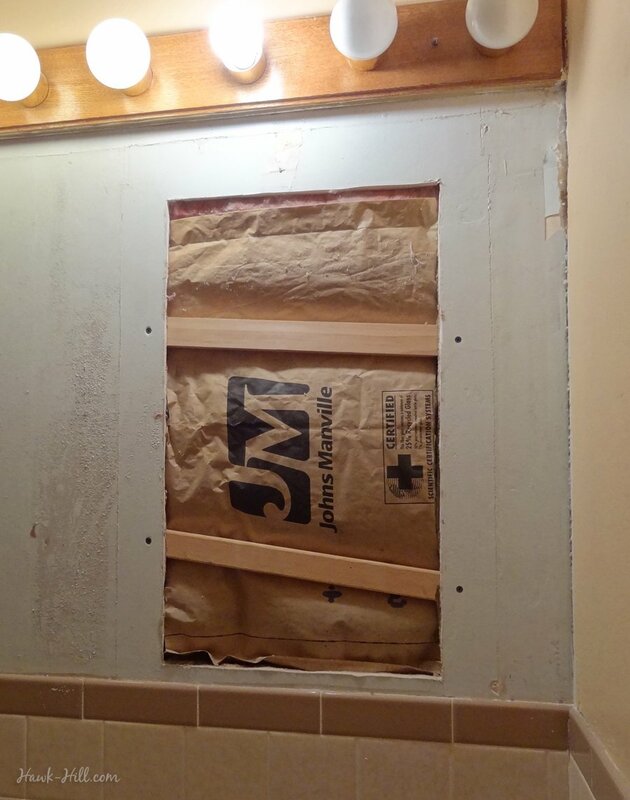 Getting the paneling to adhere to the tile proved a challenge, and I’ll confess my first attempt at this project involved heavy 4×8 sheets of plywood beadboard which proved too heavy to adhere to the wall without nails & screws. I had to scrap this material, but luckily there’s no shortage of good uses for sturdy beadboard and it ended up having a second life as a photo backdrop. On my second attempt, I used lighter, more flexible MDF beadboard panels which, because they went up on the wall in small interlocking sections easily adhered using Liquid Nails. I think this method would work equally well for pallet wood accent walls or shiplap style panels as long as your pieces were not huge or heavy. Liquid Nails worked great, but required some patience since I was concerned the combined weight of the panels peeling off the wall if I added them all at once, so instead I’d glue up one panel, wait for the glue to set a bit, glue up the next panel, etc. The tongue-in-groove joint on this type of paneling proved useful to secure the next piece while drying. 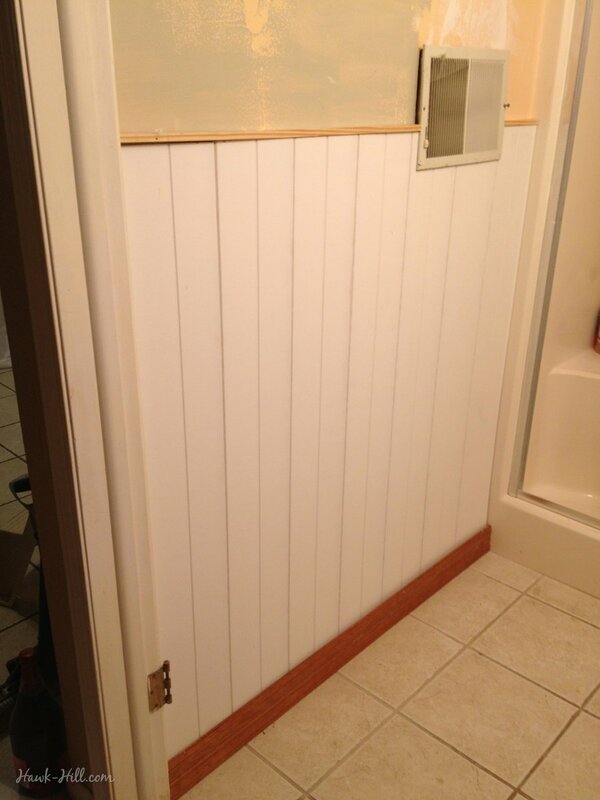 The wide beadboard paneling had to be installed with liquid nails, since the tile was too hard to screw through. 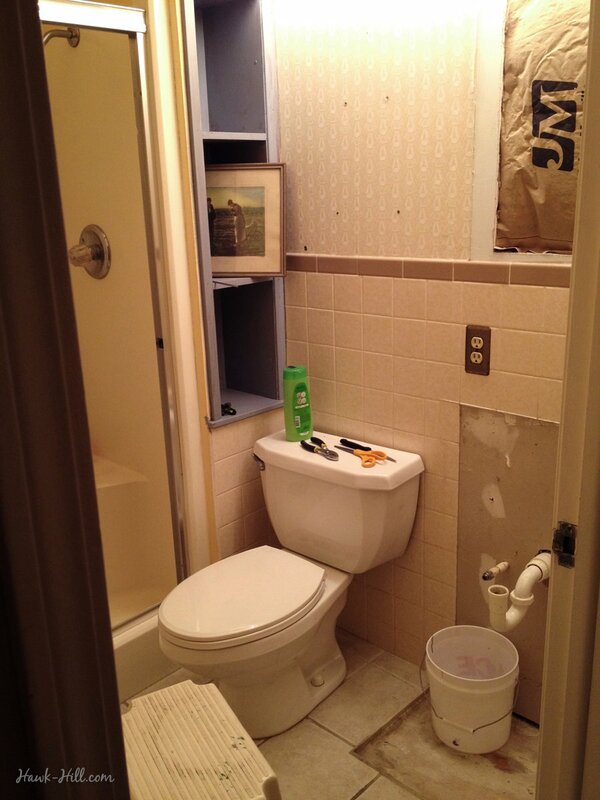 I was able to secure some pieces with drywall screws, when the paneling extended past the edges of the tile. 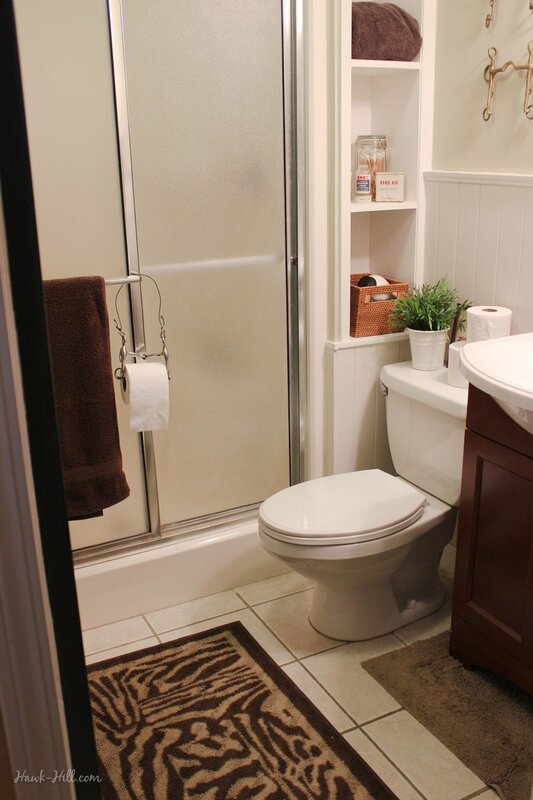 Paneling over a partial tile wall creates a small issue of the growing bulk of wall treatments creating about a 3/8″ protrusion of the lower wall out from the upper half of the wall. I solved this issue by gluing a plain piece of trim along the top edge of the beadboard. MDF paneling installed over tile, ready to be primed and painted. 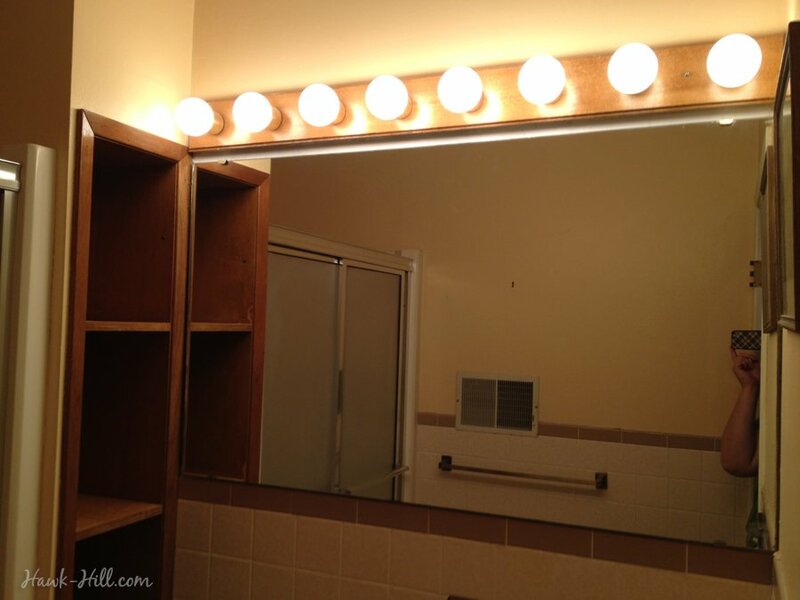 Changing the mirror and 80’s style vanity light made a huge difference in the room and hardly cost more than the price of the new light fixture! 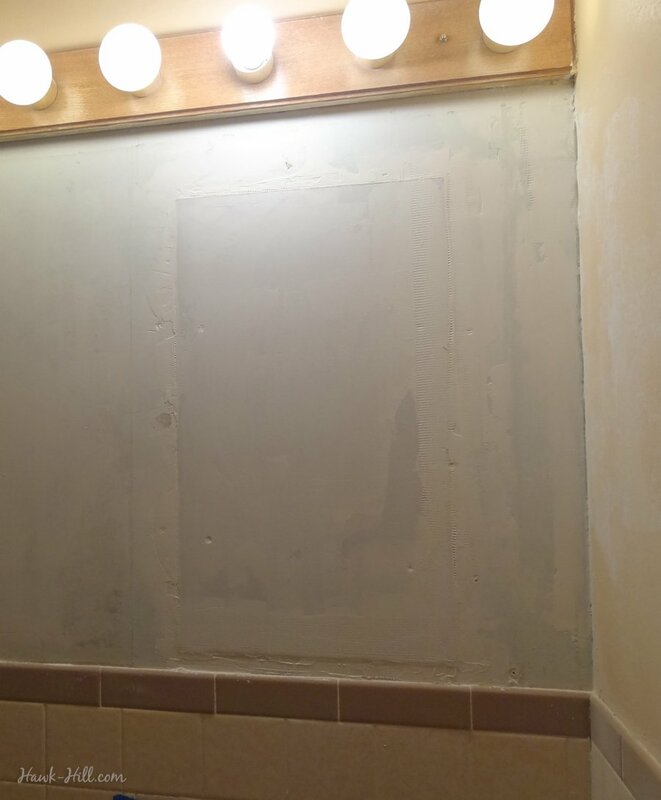 I removed the giant plate glass mirror from the wall (Not a fan of waste, I took the plate glass mirror to a glass cutter and had the mirror cut to fit in an antique frame for another bathroom). 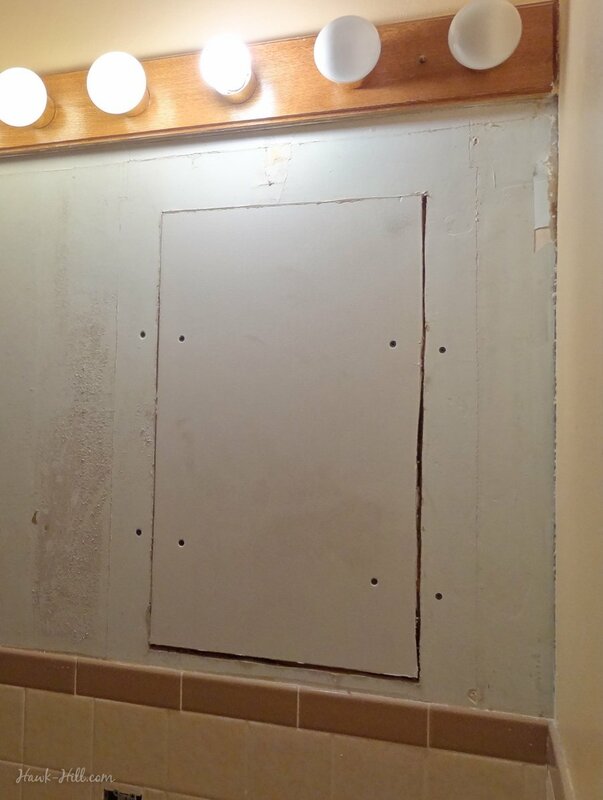 Once the mirror was removed, I discovered layers of wallpaper below the mirror and, to my horror, a giant hole in the wall where a medicine cabinet had previously been removed. Patching the hole and repairing the wall behind the large light required learning to patch drywall and “mud”, but it wasn’t too difficult and the result looks great! I was impressed how easy it was to fix a large hole in drywall, I just screwed furring strips to the back of the drywall, cut a new piece of drywall (50¢ at the ReStore! ), screwed it to the furring strips, and patched the gaps. The new light ran about $50 and the vintage medicine cabinet I hung in place of the old mirror was a $5 garage sale find. 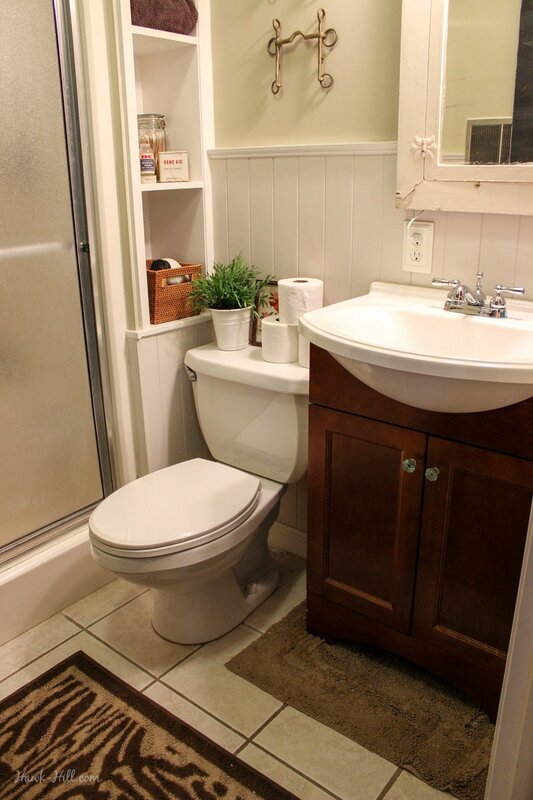 In my first and undoubtedly most horrible experience experimenting with plumbing, I pulled the old vanity, sink, and faucet out of this bathroom and took it straight to the curb! 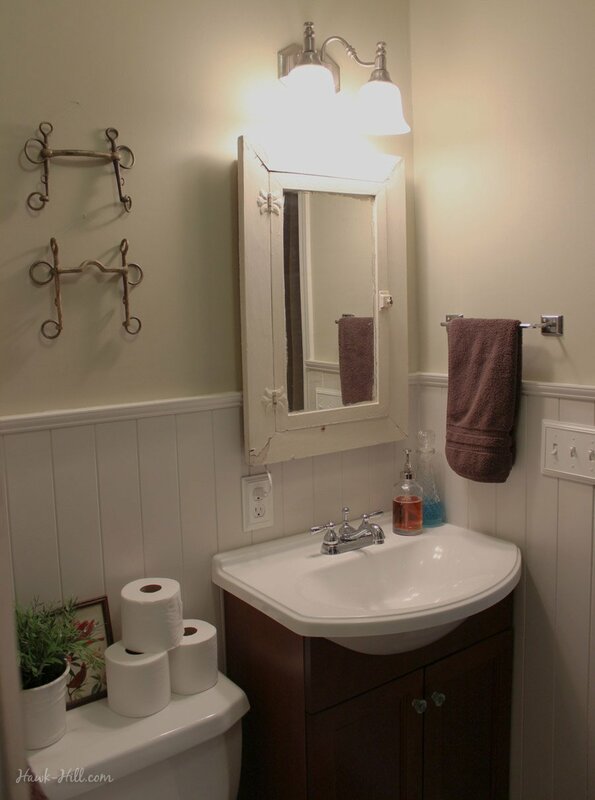 In its place, I installed a space saving sink and vanity from Lowes, at $119 (I liked it SO much and thought it was such a great value that I went back and bought a second vanity for the other downstairs bathroom!) I say “installed”, but actually, I got to the 99% installed point and became hopelessly stuck, with a broken pipe, and had to go without water for nearly a full day until a plumber could arrive to rescue me! Lowes no longer carries this model of bathroom vanity, but Amazon offers a similarly compact and stylish vanity + sink basin for $170 or this model that looks just like mine but runs around $500. I finished the vanity with an impressively classy basic faucet (also, no longer sold, unfortunately), which was only $32. I primed with Zinzer Oil Based Primer, then used Benjamin Moore “Wind’s Breath” on the paneling, Benjamin Moore “White Dove” for the trim, and Benjamin Moore “Camouflage” on top. 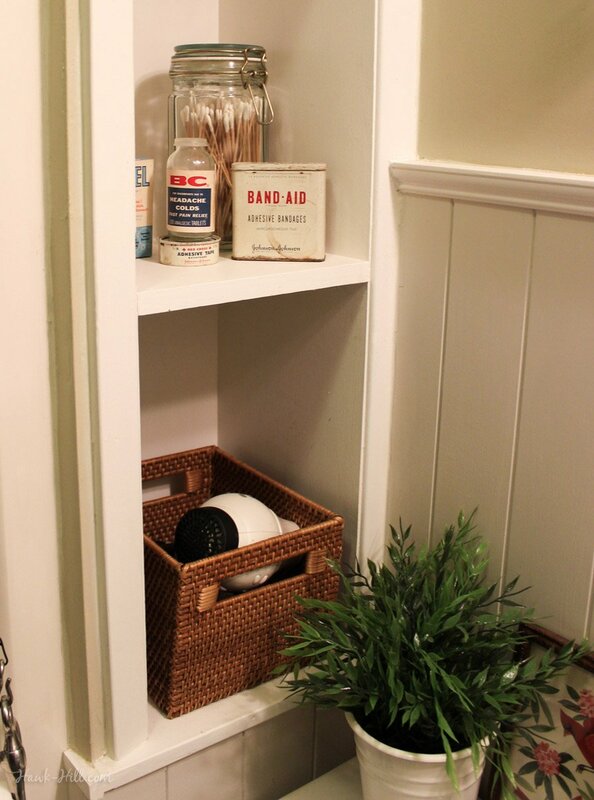 This closeup shows the tall cabinet converted into open shelving and the trim that covers the gap between the upper wall and slightly protruding lower wall. 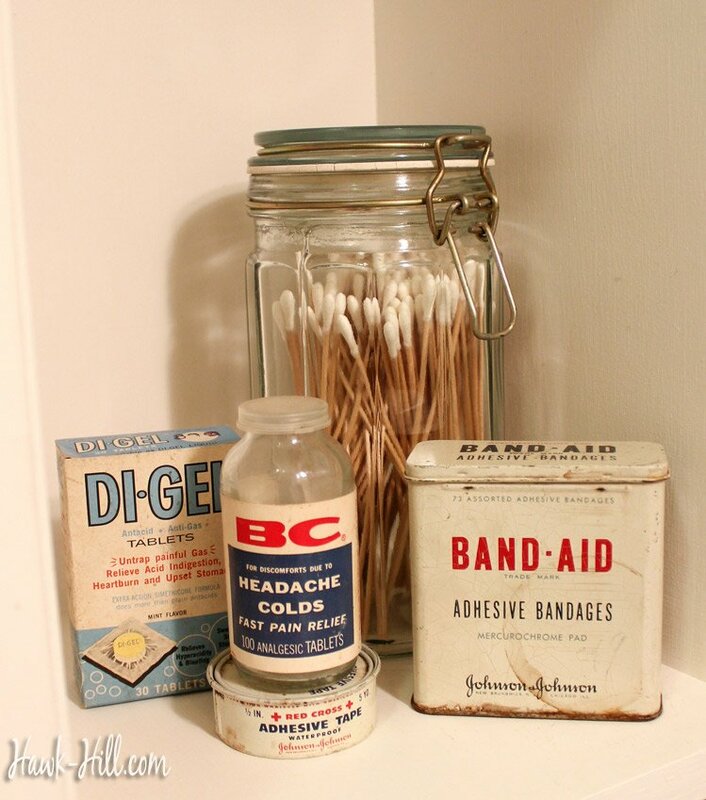 I removed the door from the tall built-in cabinet, primed and painted it inside and out, to convert it from an 1980’s era honey-oak eyesore into clean and modern open shelving- used to feature a collection of vintage washroom/first aid products. 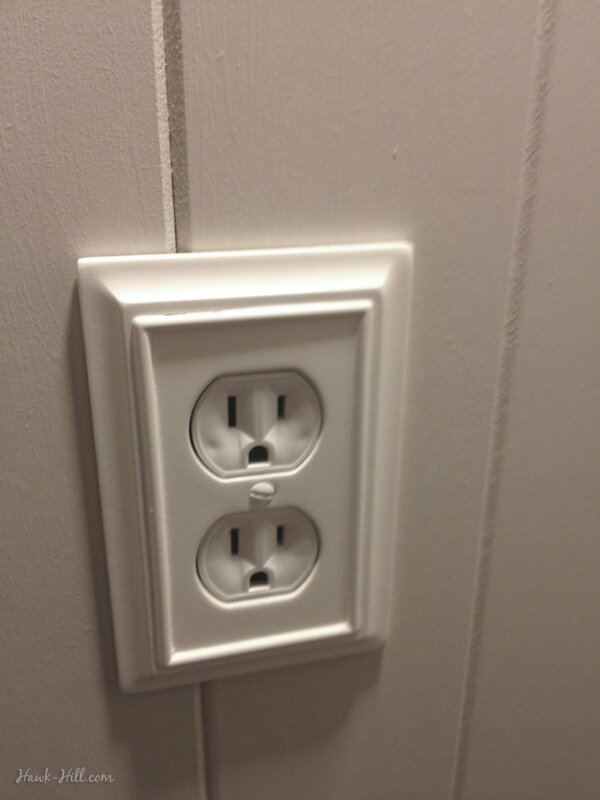 Upgraded outlet covers alway feels like a cheap investment for something that makes a big impact on the room. 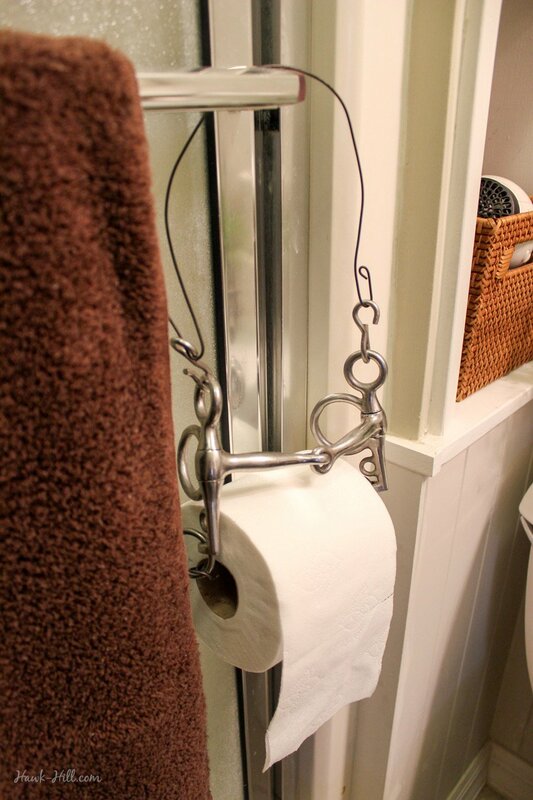 I ditched the standard fare all-look-a-like towel and toilet paper holders for an industrial style towel rack I found second hand and a horse bit turned toilet paper holder. 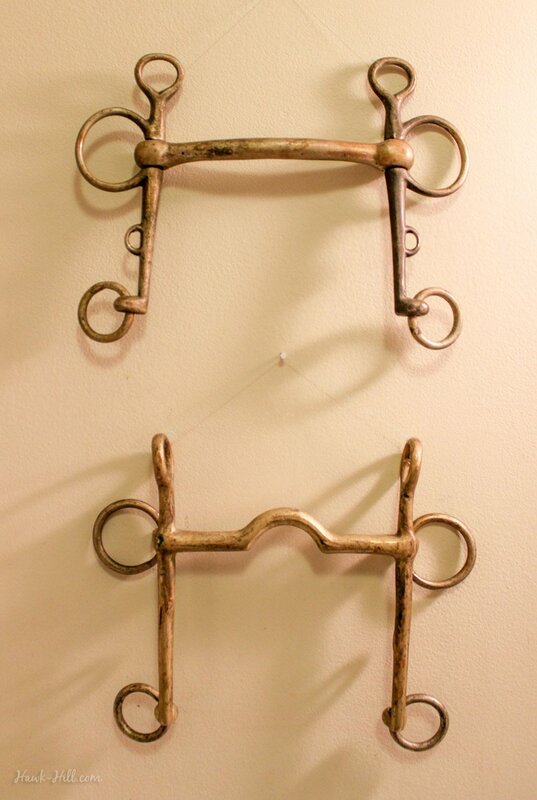 Wall Art: Vintage brass Pelham bits. I’m certain this tutorial would work equally well for adding shiplap over tile- just be sure to use crack filler to fill any spaces between tile (where grout sits) that might show up in the gaps between pieces of shiplap. Beautiful job! 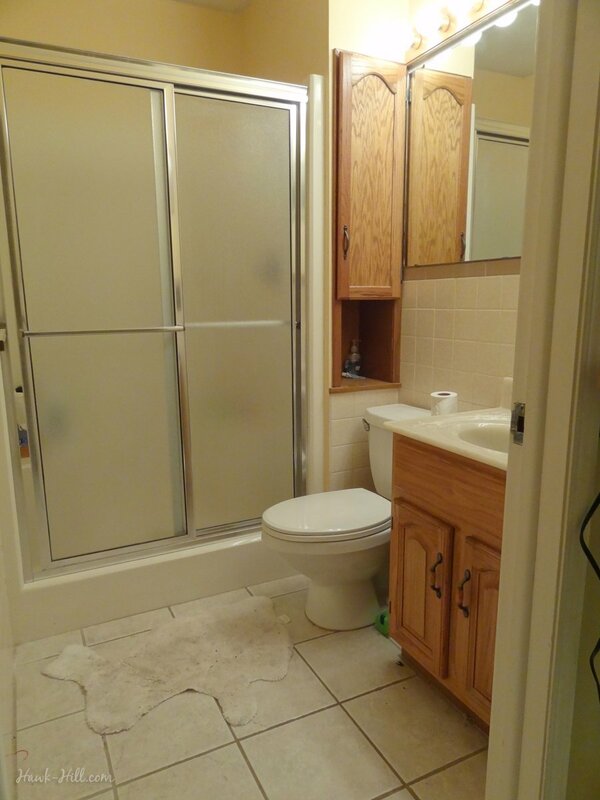 I ended up here while trying to find [non-existent] advice on putting wainscotting over mirror. I, too, can only use adhesive. No screws through mirror! 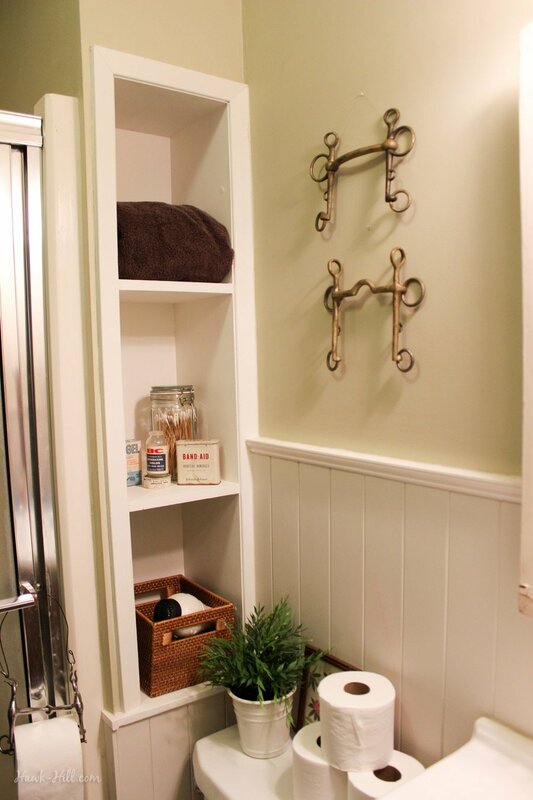 Where did you get your bead board in smaller sections? At the time, I bought it at Lowes. I wish I’d kept the brand name, sorry! It was MDF rather than plywood, which I really liked because it made it a bit flexible. Wow! It really looks amazing…I’ve always wanted to try to do exactly what you did but never had the guts to do it. You’ve inspired me to try to give it a go. Everyone deserves to be surrounded by a beautiful environment- Great job! It took me a solid 2 or 3 weeks, but only because I was working on it myself on nights and weekends, and took my time!